PowerColor has introduced the first passive HD3870 card on the market: the PowerColor HD 3870 512MB SCS3 Silence Edition. The card retains reference clocks, the core runs at 775MHz, while the 512MB of GDDR4 memory is clocked at 2252MHz. As all HD3800 series cards, it supports DX10.1, PCI Express 2.0, CrossFire X and has built-in HDMI with audio. The aluminum cooler has two heatpipes, unlike the triple heatpipe cooler we saw on Sapphire's HD3850 Ultimate edition card, here. 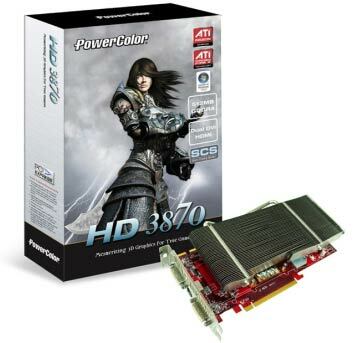 Hats off to PowerColor for showing off the first passive HD3870. However, if you're interested in getting one, you'll have to wait until January. You can check out the detailed specs on the product page, here.